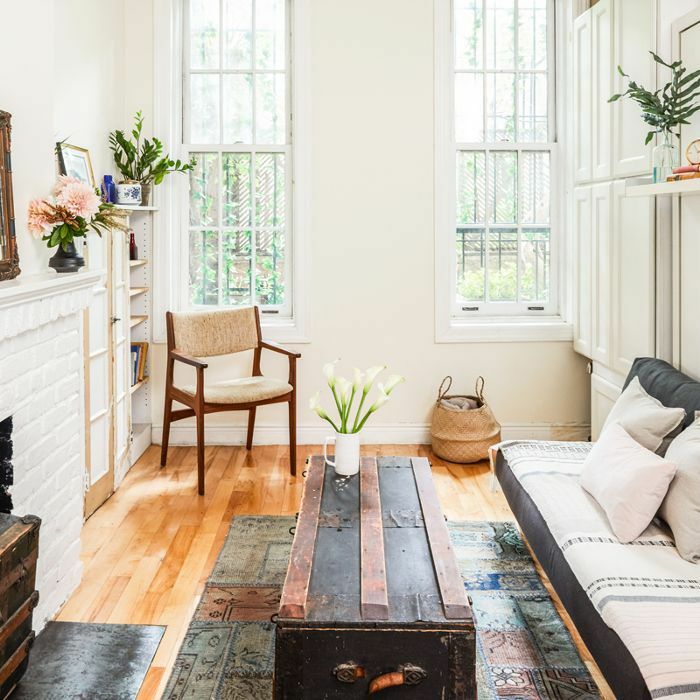 The definition of a small space might differ from city to city, but no matter where you live, there's no denying that a 242-square-foot apartment is tight, even by Manhattan standards. That's exactly the square footage Jourdan and Tobin Ludwig had to work with when decorating their West Village studio. The size of the apartment wasn't the biggest challenge though. When the couple started renovating, Jourdan was booked on a multi-city work trip, leaving her then-boyfriend Tobin to take the lead. "Tobin would FaceTime me in for tile selection at HomeDepot, [and] send me pictures of drawings of his designs and layouts," she says, noting that they had only been dating for a few months at the time. "Looking back, if we didn't have that blindly intoxicating new love the project would have probably all fallen apart. I basically came home from tour to a completely finished, beautiful apartment—and decided Tobin was the man I was meant to marry." The apartment is clearly a labor of love. Every inch has been maximized and every detail considered, from the genius fold-out bed to a hidden dining table that turns the bedroom into a dining area. The best part? The couple is ready to part with their gorgeous home and has listed the abode on StreetEasy for $499,000. Take a look inside the smartly designed studio that could be your new home. The studio needed to function as a bedroom, living area, and dining room, so the couple searched for furniture that could be easily tucked away when not in use. Their first buy was the most transformative: a fold-up bed by Clei. "I had been renting small studios for years and had been pining for a Clei Murphy bed, but the investment didn't make sense in a rental," Jourdan Tobin tells MyDomaine. "When I would view apartments for purchase, I could envision which Clei design would fit (or not fit) within the footprint and mentally included the investment into the apartment purchase price. Needless to say, it's a beautifully made bed, and we're still happy with the decision." Another smart addition is a fold-out dining table, which turns the narrow space next to the bed into a dining room. "The great thing about the Wee Cottage is that it is a perfect rectangle, so every inch can be used," she says. "The pocket table design was original to the apartment [but] it was broken and unusable, so we started by replacing that." It allows the couple—and new owners—space to entertain and invite friends and family over for dinner, no doubt making it feel much bigger than it actually is. The apartment contains a carefully curated mix of antiques and vintage finds, including Ludwig's favorite, two trunks that form the coffee table. "It took lots of antiquing to find the perfect sizes for the trunk to fit in fireplace and for another to act as our coffee table with the right height so you don't have to move it when the bed was down," she explains. "They provide many functions beyond décor—acting as tables, seating, and storage. We could move them around the apartment for the perfect cocktail party setting or do a couch and trunk seating for a six-person dinner party." Thankfully, they're planning to leave the trunks for the new owners to enjoy. Despite its size, the kitchen contains everything a home chef might need, including a stovetop, oven, storage, and ample counter space. "We love to cook, so we actually grew the footprint," she says of the all-white kitchen. "We upgraded the gas stove by a couple of inches, added butcher block counters and shelves, a pot rack and found a butcher block kitchen island that could fold up into a few inches wide and be rolled into the closet if it needed to be stored." Reflecting on the project, Ludwig has two pieces of advice for others styling a small studio: Question the need for storage and make the most of walls. "Utilizing your vertical space is everything. [Also], storage is essential, but the trade-off is it takes up square footage—so don't add storage just for storage's sake!" The couple has clearly put a lot of thought into the gorgeous studio, but they say it's time for them to move on. "It's a very special place for us with so many memories," says Jourdan Ludwig. "Tobin dropped down on one knee and proposed to me in the Wee Cottage, which made me spill so much champagne on the couch that we had to have it recovered! We're sad to be letting it go, but with our second child on the way, it's time for a new owner to enjoy this special spot." Whoever gets to call this little West Village apartment home is certainly lucky.